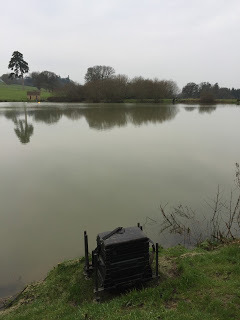 For the final Royal Oak match we were back on the pond as the river was still pushing through and hopefully it would fish better than last week! After a sausage sandwich it was time to dip in the hat and my home for the next five and a half hours this week was peg 14 on the bottom bank which I was fairly happy with as I’ve done okay the last couple of times I’ve drawn it. It was a case of deja vu for a couple of anglers as Karl was on peg 19 again for the fifth time and is thinking about getting Wi-Fi put in!, Baz was on peg 6 for the second match on the trot and I think he’s getting a bit fed up with it now! Elsewhere Hurf was on 18 and agreed to a side bet and after Scotty Russell had told us how much he likes peg 4, he only went and drew it! When we got to the pond, most of the chocolate colour from last week had dropped out of it and with it being quite mild I felt sure it would fish well today. The wind was mostly blowing from right to left and missing me although the lads on the road side would be in for a chilly day! 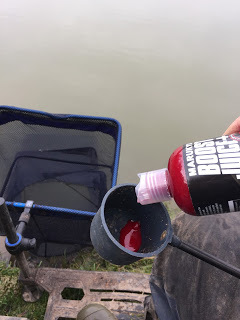 First job as always was to mix my groundbait and today I was using Bait-Tech Pro Natural with a little Thatchers Dark added. 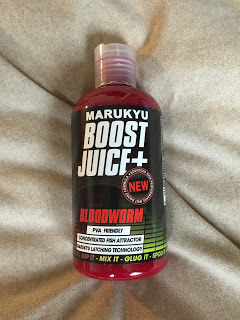 I’d also been lucky enough to win some Marukyu Bloodworm Boost Juice from a Facebook competition I entered recently and thought I’d put some in the water to mix my groundbait. It’s a lovely thick liquid with a potent smell and is bright red (look out for my review coming soon!). Rigs were the usual 0.5 gram Drennan Roach for on the deck with a spread bulk and two droppers to A 0.10mm hooklength and a size 18 barbless B611 and a little Preston Chianti for up in the water (not used). 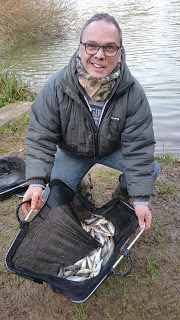 On the whistle I cupped in two balls of groundbait at 10 metres before starting with a single disco pinkie on the hook. 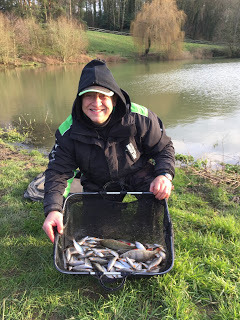 Once again it took a while to get my first bite which of course I missed but I had seen seen Scott, Fieldy and Hurf catch small fish so already it was better than last week! My first couple of fish were 2oz chublets and although it wasn’t fast and furious, I was getting regular bites. Scotty Jackson and Dave Sydenham turned up for a walk round and just before they reached me I struck into a better fish and landed a lovely 8oz roach while they were behind me. 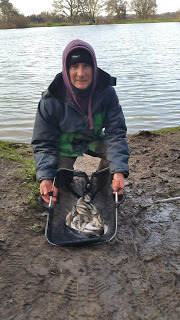 They reported that Scott Russell was getting a fish a bung and had 29 when they left him, so even with them being on the small side he had 2lb plus. After the first hour I only had eight fish but I had that decent roach, five chublets plus a couple of small roach for around a pound and a half, so not too far behind him at this stage. 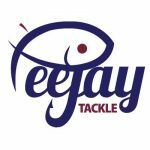 Fieldy was catching well, Hurf looked to be doing okay and after a slow start, Ash on peg 22 was now swinging in fish regularly. 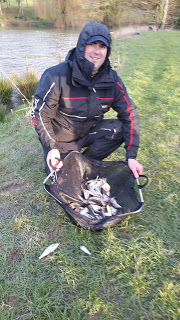 The second hour was much better for me and I added another 22 fish all on single pinkie including half a dozen net roach, a nice 6oz perch plus some more chublets. Scotty and Fieldy were still catching really well but I hadn’t seen them net too many fish. 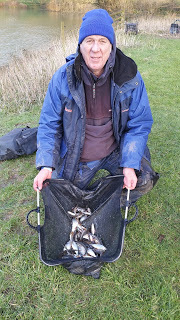 Going into the third hour, I tried caster for the first time and it was a fish a chuck with a lot of them requiring the landing net, including some nice rudd. The clicker was reading 59 fish and we still had two and a half hours to go. 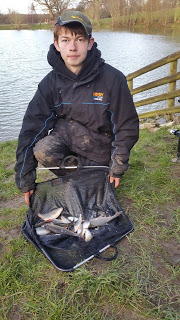 After a decent start, Hurf had slowed up and Karl next door had landed the odd better fish as had Rob on peg 20. Ash still looked to be catching well although I couldn’t really see how Terry was doing by the pump house but at least he was a bit more sheltered from the elements this week! I was still doing okay and with about an hour to go I was on 99 fish when the float sailed away and I struck into solid resistance, the fish didn’t tear off which suggested it wasn’t a chub and slowly but surely I gained ground until eventually a decent bream came to the top and I slipped the net under it, what a bonus! I was still getting some nice roach and rudd and then 15 minutes later I’ve hooked another lump that plodded around and a similar sized bream surfaced and as I reached for the landing net, the hook pulled out and agonisingly, the fish lay there for a second, just out of reach of the landing net before waving goodbye with it’s fin (or was it giving me the finger! ), gutted! 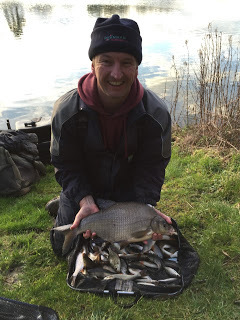 I carried on catching the odd roach until the end of the match to finish with 117 fish and I’d had a lovely days fishing, I just hoped that lost slab wasn’t going to cost me. 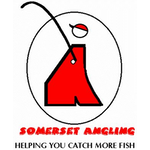 After packing up we started the weigh in with Scotty, he’d done well yet again and had 208 fish for 12lb 5oz, Baz had struggled a bit in peg 6 for 2lb 10oz before Fieldy had 10lb 11oz from peg 8. 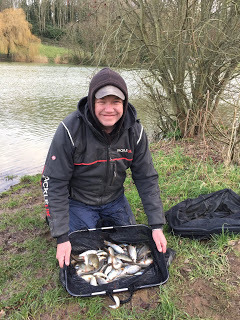 Then we got to Justin and despite spending quite a lot of time on the feeder, he had some quality roach on the pole for 7lb 15oz, Steve P had 3lb 2oz but had lost a big fish and then we got to my peg, the bream weighed 4lb 2oz and the rest of the fish took the needle round to 19lb 12oz. 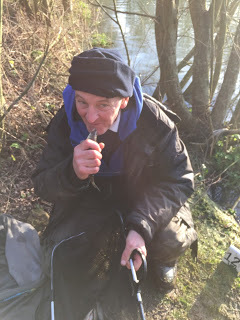 Steve struggled for 3lb 2oz but gave each fish a kiss before returning them safely! In the league, after eight matches and dropping the worst result, Graham Field was crowned the Royal Oak League Champion with Robin Cox second on fourteen and I finished third with seventeen. 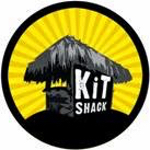 The club would like to say a massive thanks to Steve and Cindy at the Royal Oak, Ilminster for their continued support and looking after us all so well in the mornings and thanks also to Rob for running yet another excellent series of matches.